Let’s take a look at some of the considerations to help with this particular decision. Of course, before deciding which is the right option, it's important to correctly distinguish between the two. 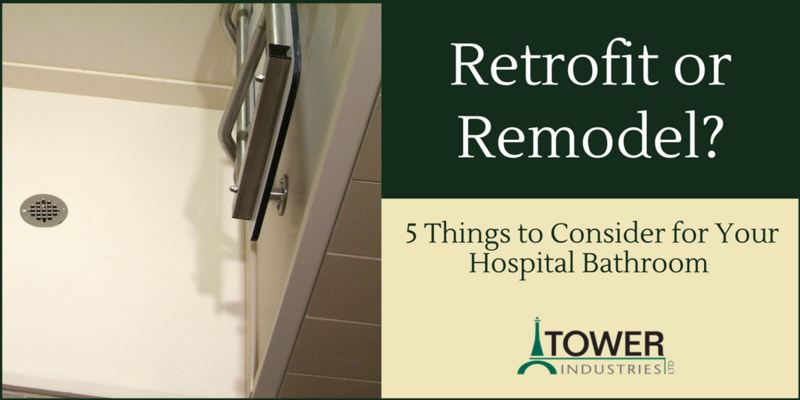 Retrofitting is updating your bathroom by building over what is already there, whereas remodeling is tearing it out and replacing it, or starting from scratch. Like most choices, there are benefits and drawbacks to either side, so it's worth taking a closer look. In the existing design for the hospital bathroom, there may be inherent problems that need to be corrected, such as the ventilation plan to prevent mold and mildew. Solid surface showers offer a solution to this, as the material is non-porous and is resistant to mold; plus, there is no grouting to maintain or clean. Lighting and spacing are also issues that should be analyzed in your new design, and may require more substantial remodeling efforts in some cases. Many people underestimate the features that are available with a retrofit. While it's true that, in some instances, a remodel is the only path to achieve a specific end result, in most cases, retrofitting can deliver the same outcome. This is particularly true for hospital showers, as opposed to residential settings where very specific homeowner visions may come into play. For hospital showers, safety features are of key importance. This includes handles or bars, chairs, non-slip flooring, and other specific design components as well. The good news is; these can all typically be achieved via retrofitting, and don’t always require a full remodel. Price is always an essential consideration in the decision-making process, and budgets are always tight when it comes to something like updating hospital showers. More often than not, retrofitting is a much more affordable solution than entirely remodeling, while still delivering the look and feel of a brand new shower. Time for project completion is another component you need to keep in mind. What kind of timeline are you working with? Retrofitting is typically a less intensive project, which not only means it usually costs less, but also that it should be completed in less time. Whether you are thinking the right path is a retrofit or a full remodel, take the time to look at these things and be sure you make the best decision for your specific project. Tower Industries provides a huge selection of solid surface products for hospitals, including hospital showers, wall panels, shower accessories, countertops, and more. Learn more about how we can help and see the full extent of our capabilities by browsing our site, or call us directly at 800.807.8889 with any questions.